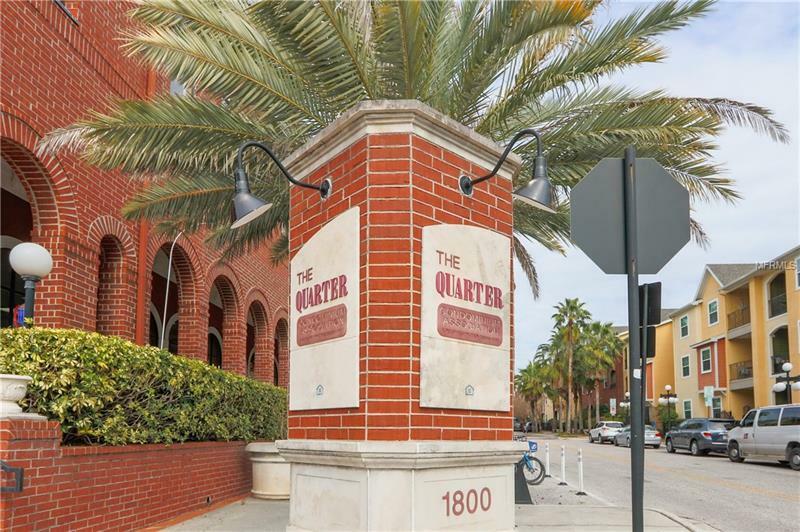 Great opportunity to purchase an easily accessible ground floor condo in the growing Ybor city area. This is a super clean condo with walk-in closet, covered patio with storage closet and lots of storage in the kitchen. This condo is located in the main building, just steps away from the pool/spa, fully equipped workout facility, mini grocery store and sandwich shop, and recreation room (complete with kitchen, movie theatre room, table shuffleboard, foosball table, and pool table). Additionally, The Quarter at Ybor utilizes a valet trash system so there are decorative benches out in front of every door and trash is collected 5 days a week at no extra charge. The amenities at The Quarter are truly second to none. The community is located just a 5 min walk to all that Historic Ybor City has to offer including tons of shopping, restaurants, and events. There is a trolly stop a few streets away that allows direct access to Channelside and Downtown Tampa as well. This purchase comes with one assigned parking spot in the covered, gated garage on the lower level. Pet Restrictions: All pets require HOA approval. Breeds considered aggressive by insurance standards are prohibited.